“Påskbord is an Easter tradition in Sweden that is celebrated with friends and family. We are very excited to invite everyone to join us in experiencing this special piece of our Swedish culture. As we welcome the beginning of spring, IKEA invites family and friends to celebrate the Easter holiday with its annual Swedish Påskbord. 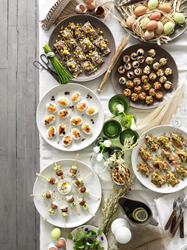 On Friday, April 7, 2017, join participating IKEA stores nationwide** for an all-you-can-eat smörgåsbord buffet filled with traditional Swedish classic food offerings such as Swedish meatballs, smoked salmon, assorted Swedish cheeses and many other savory favorites. Tickets are available for only $16.99 per person / $4.99 for kids 12 and under, or at a discounted rate for IKEA FAMILY members ($12.99 per person / $2.99 for kids 12 and under). Seating is limited, so those who are interested in attending are encouraged to purchase tickets early at their local IKEA store. To locate and contact your nearest IKEA store for more details, including local seating times, visit the “Store Locator” page on http://www.IKEA-USA.com and enter your city/state or zip code. Those who are unable to attend the event can still experience Swedish Easter traditions at home! Visit the Swedish Food Market in your local IKEA U.S. store to purchase select items from the Påskbord menu, including KÖTTBULLAR Swedish meatballs, or to explore and try ingredients for other Swedish recipes, such as salmon and avocado salad. IKEA FAMILY is a benefits program that offers membership perks including special product discounts, sneak previews, free coffee and tea in the IKEA Restaurant, and more. Consumers can sign up for the free program online or in-store. ** Not available at the IKEA Carson store.